Hooray for scraps! I always seems to have scraps laying around on my table. This design was inspired by Gingham Gala strips from a previous project. I was playing with the colorful Organdy Sale-a-bration Ribbon Pack and coordinating Gingham Gala Designer Paper strips (scraps) and created this bright and springy Vertical Greetings Happy Birthday design. Next the Gingham Gala strips came into play. I was trying different stamps for the cut out and had my second “ha-ha” moment. The rectangle cutout with the strips adhered to match the ribbon on the card front. Then adhere the rectangle to fit within the cut-out on the card back. I did my super happy chair dance. Woohoo! Finally I contemplated what sentiment I wanted. I couldn’t find anything that made me happy. No pun intended……Lol! After going through all my stamp sets I came across the Vertical Greetings set and new it would be perfect. I went a step further and made the sentiment float within the cutout. There was a narrow strip of window sheet on my desk and I placed it between the layers like the ribbon strips. Then I adhered the sentiment with glue dots to the window strip. Voila’!!! Thank you for stopping by today. I hope you enjoyed today’s bright and springy design and are inspired to get your stamping mojo on! Have a great day! 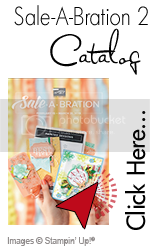 Don’t forget today is the last day to earn FREE Sale-a-bration items. You can check out what fun items are available here.